We're having a flash sale! Download now and get a free upgrade! Clockwise is the smart assistant that helps you wake up easier. It is the best free smart alarm clock app that speaks to you content you customize. It is the more advanced version of your current alarm app that allows you to attach widgets to each of your alarms. These widgets, called modules, get custom content from your favorite websites and sources. Then the alarm speaks to you the content you set. Clockwise makes waking up easier by getting you out of bed to the sound of interesting and inspiring content every day. Clockwise has all the regular features that your current alarm clock has like snooze, alarm tone, and volume settings. The app adds on the ability for you to select from a number of voices the narrator you want to speak to you your content. You can set as loud or as quiet as you want the voice and alarm tone to wake you up. You can select your alarm tone from your own music selection. It also provides cool features like quick snooze and wise play. Quick snooze allows you to place your hand over the front of your phone to snooze the alarm without giving much effort at all. Wise play allows you to set a time for Clockwise to wait until it speaks to you your content without you having to lift a finger. Clockwise allows you to name each alarm, use a 24 hour clock, enable in app sounds, set repeated days for your alarm to go off, and much more. You are allowed to use three active modules at a time per alarm and up to three active alarms at a time. You can upgrade Clockwise for 0.99 to get no ads, unlimited alarms, and unlimited modules. You can get started with several easy steps. Clockwise improves waking up by speaking to you new content every day that you customize. Clockwise Smart Alarm will replace your current alarm clock. Clockwise uses latitude and longitude coordinates to retrieve weather and traffic information. This information is only stored on the device and is not linked to specific users. In order to personalize the alarm tone, Clockwise requests permission to access the device storage. This allows Clockwise to play user selected songs for the alarm tone. Clockwise strictly only accesses files in the device Music folder. Clockwise does not store or transmit user photos or videos. Clockwise is the most intelligent alarm clock app on the market. 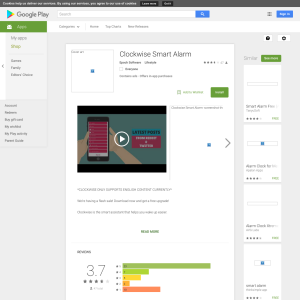 Clockwise has been featured in Android and Me, Android Guys, Techwibe, and several other blogs. The free smart assistant will replace your alarm clock. So what are you waiting for? Start waking up easier today and download Clockwise Smart Alarm!